Shown from left at Hillsboro City Council’s January meeting are Council President Lee Koogler, seated in the background, Councilwoman Wendy Culbreath, Councilman Brandon Leeth, Sgt. Shawn Kelley of the Hillsboro Police Department standing in for Heather Collins as clerk, and Hillsboro Mayor Drew Hastings. Hillsboro Mayor Drew Hastings on Monday told Hillsboro City Council that the city has reached a “workable compromise” with the Paint Creek Joint EMS/Fire District, potentially putting an end to months of debate and negotiation on fire coverage for the city by contract or membership, as well as the sale of the city’s fire house on North East Street. 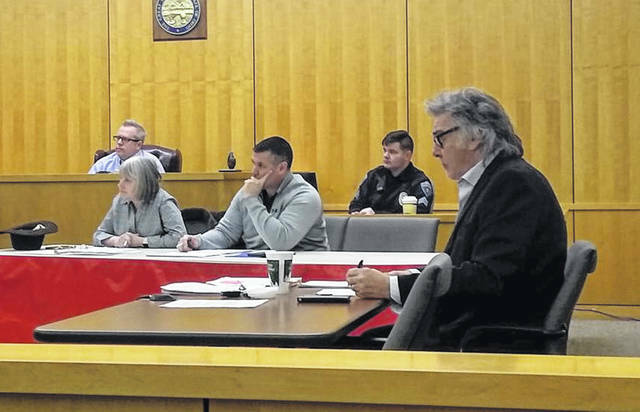 Hastings said city officials met with Paint Creek reps on Dec. 27 and discussed the city signing a three-year contract that would culminate in Hillsboro being accepted as a voting member of the district. The contract would also include regular payments from Paint Creek that would eventually be counted toward the purchase price of the fire station it currently occupies on North East Street. At the end of the contract, when bonds on the fire station have matured, the city would transfer the title for the building to Paint Creek and the district would in turn transfer its old fire station on Governor Trimble Place to the city. As previously reported, the city has been using Paint Creek’s services on a contract basis, paying about $570,000 every year from the city’s General Fund. If Hillsboro joins the district, an automatic 5.5-mill property tax will be put in place to pay for fire coverage. Hastings said under the three-year contract, the city would pay Paint Creek “very close to millage equivalent” on a yearly basis, which is said to be about $650,000. Council voted to join the district late last year, but Paint Creek withdrew its offer for Hillsboro to join after deed complications resulted in Hillsboro taking the property off the market. Meanwhile, the time came for Hillsboro to pass a budget for 2019, so council approved a temporary budget at its December meeting to cover the first quarter of the new year. Finance Committee Chairman Justin Harsha said his committee will meet to discuss the issue after the Paint Creek board makes a decision on the contract. According to the mayor, Paint Creek will meet Jan. 18 to deliberate. Hastings said he believes three years will give the public “a chance to digest” the city joining the district — an idea that proved to be unpopular with several citizens in 2018, some of whom said the levy amounts to a “double tax,” since an income tax approved in previous years was proposed as an emergency service funding measure. Hastings said he was “a little disappointed” in the Highland County Community Action Organization and the Highland County Board of Developmental Disabilities for correspondence between those organizations and council. The mayor said the correspondence, spurred by his comments at a previous meeting about group homes for disabled people, were “misinformed” and “misrepresented my meaning.” Hastings said he could invite Community Action to a future council meeting to resolve the issue if council requested. Hastings also said the old BP station on West Main Street, which he said has been up for sale for nearly 10 years, may soon be sold to a developer. The mayor said a steering committee is continuing to develop Imagine Hillsboro, a comprehensive plan for the city, and a meeting will be held Jan. 22 for public input. For more information on Imagine Hillsboro, contact the city at 937-393-5219. In the Hillsboro Planning Commission report, Hastings said the group met recently and discussed “concerns” with Community Action rehabbing local homes and whether they meet zoning standards. He said the commission also discussed the Hillsboro comprehensive plan, vacation of an alley, zoning for a duplex, and sign permits. Later in the meeting, Hastings said Christmas decorations in the uptown area looked “really good” during the holiday season. Hastings also read a report from Safety and Service Director Mel McKenzie, who was absent due to illness. McKenzie said in his report that the street department is “working hard to keep the primary travel ways clear” from snow and ice, and that once primary roads are cleared, secondary roads will be treated. McKenzie said alleys are maintained on an as-needed basis and during regular work hours. The safety and service director also said in his report that crews will work this winter on installing restrooms at Harmony Lake and a pedestrian bridge between Shaffer Park and Liberty Park. A Facebook page will be created for the city parks, he added. During discussion of a parks director being hired for the city, Council President Lee Koogler placed the matter in the Civil Service and Employee Relations Committee, chaired by Councilwoman Mary Stanforth. Hastings said the city has a job description for the position, but particulars will have to be decided. • Approved an ordinance granting South Central Power Company the right to work in the City of Hillsboro to provide light, heat and power to its customers. • Heard a first reading of a resolution authorizing the city to submit applications for participation in the Ohio Department of Natural Resources Recreational Trails Program and the Clean Ohio Trails Fund, and an ordinance declaring improvements to parcels of property in the city to be a public purpose and exempting the improvements from real property taxation, establishing a tax increment fund. • Reviewed correspondence from the Highland County recorder about recording standards. • Entered executive session to discuss property acquisition. No action was taken.